In the financial and commercial centre of A Coruña this centre provides a variety of flexible solutions including virtual offices, serviced office space, meeting rooms and breakout spaces. There is also shuttle services directly from the centre to the airport and bus stations. Other useful services include 24-hour security, training rooms, high-speed internet and conferencing facilities. The site is also managed by a friendly reception and administrative support system who are always available to assist when they can. Local amenities surround the centre including an array of local bars, restaurants, hotels and impressive scenery. Located in a quiet residential area just 10 minutes from the city centre and three minutes from the industrial area of POCOMACO, this business centre is bathed in natural light and provides co-working space, a multi-purpose area, meeting room and reception area. It is accommodating, comfortable and inspiring, and benefits from a strategic location that is close to many transport links; making for easy commutes. Situated just 15 minutes from Coruña Airport this landmark building provides tenants with spectacular views from a range of flexible office spaces including private offices, meeting rooms and co-working space. Other services include; spacious meeting rooms, IT support, videoconferencing, professional maintenance service and a dedicated reception desk. 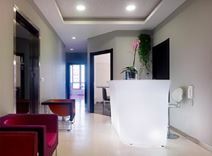 In addition, the centre is extremely well connected via public transport with train stations in the immediate vicinity, and the La Coruña Airport a short 15-minute drive away. Restaurants, bars and other retail outlets can also be enjoyed outside of working hours within close proximity to the business centre.